A China travel visa and a valid passport are required documents for entering into the mainland. If you arrive without a valid travel visa, you will not be allowed to enter, may be fined and will be immediately deported at your own expense. In fact, without a proper visa, the airline will most likely not allow you to board. Applicants are required to appear in the visa office to apply. If you cannot apply in person, you can send a relative, friend, or travel/visa agent to submit the application on your behalf. Travel document expediters are professionally qualified to obtain visas quickly and efficiently. Expediting services are usually located in major cities where embassies and consulates are found. If you are in need of such service, click the link to apply online for an expedited China travel visa. A minor who will travel with both parents must include copies of the information page of passports, and driver's licenses of both parents. A minor who will travel with only one parent must submit copies of the information page of both parent's passports or driver's licenses and a completed authorization letter from the non-traveling parent. A minor who will travel with neither parent must include copies of the information page of both parent's passports or driver's licenses and a completed authorization letter from both parents. Apply online to get a visa for China fast. You can open the application forms by clicking the link below. The document includes special instructions for completing the Chinese visa application form. The application has 6 sections on 4 pages. The form must be completed on your computer and then printed. Handwritten applications are no longer accepted. Review the application before submitting it. There are a variety of visas available depending on the purpose of travel to China. Each type of visa has additional requirements not listed here. After filling out the application form and gathering the appropriate documents, you need to choose how to process your visa. The China Embassy and Consulate General only accept applications submitted in person. Processing your China travel visa takes 4 business days for regular service and 2-3 business days for express service. Same day rush visa processing is available for an additional fee. The application must be submitted before 12:00 pm in order to be processed by 3:00 pm. Apply online for your China travel visa. A Chinese tourist visa, also known as an L visa, is usually valid for 30 days from the day of entry according to the Chinese Consulate in San Francisco. It might be extended through applications to the local public security bureau. You have the option of a single-entry or double-entry or multiple-entries visa. Upon arrival, your documents will be examined by an inspection agent. If everything is correct, they will be stamped with an entry seal. The tourist visa allows you to travel to China for sightseeing or to visit family only. If you want to travel to any area not yet opened to the tourists, you will have to apply for a Foreign Travel Permit at the local public security organ. Chinese Business Visas (also known as the F visa) are also valid for 90 days with a duration of 30 days for each entry. To apply for a single or double entry visa, you must have an official invitation from a Chinese host company or government department or organization. U.S. citizens may apply for a six-month or one-year F or L visa valid for single, double, or multiple entries. U.S. citizens with business licenses or investment certificates may apply for two-year multiple entry F visas if they have been granted shorter F visas at least twice in the last two years. Another group of U.S citizens eligible for long-term F visas are Chinese-Americans born in the PRC or spouses of Chinese citizens. click here for expedited Chinese visa courier service. If you want to visit any of the non-open cities, you need to acquire a travel permit. You can apply for these at the local public security bureau. If you plan to leave China and then return, you need to get a China travel visa that allows for double entry or multiple entries. Required for stays of six months or longer for the purposes of all study including graduate and post-graduate, as well as internships. Click here for more information about China student visas. This type is required for commerce or professional academic exchanges, or for the immediate family (spouse or children) of individuals engaging in those activities. 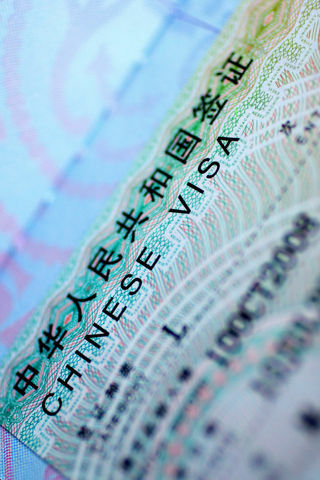 Click here for more information about work visas to China. This type is required for international ship, airline, or train crew members. Journalists in China for temporary business need a J-2 visa, while J-1 visas are required for resident foreign journalists and their spouses and minor children. This type is required for travelers who will be transiting in China for more than 24 hours, or who need to pass through immigration and leave the airport during transit. Required for permanent residency in China. You can submit the application for a visa to China yourself but you will face large crowds and long lines. Parking isn't always easy to find either. The China Embassy requests that you not call them about your application so you won't be able to track your process. Errors or incomplete information on your visa application form can result in denial of your visa and delay in your plans. The best way to avoid the crowds, the lines and the difficult parking is to contract an visa expediting courier service to submit the application on your behalf. There are many expedited service providers online. After reviewing nearly fifty companies, there are only a handful that we recommend. To get a visa for China, we recommend It's Easy Passports & Visas.